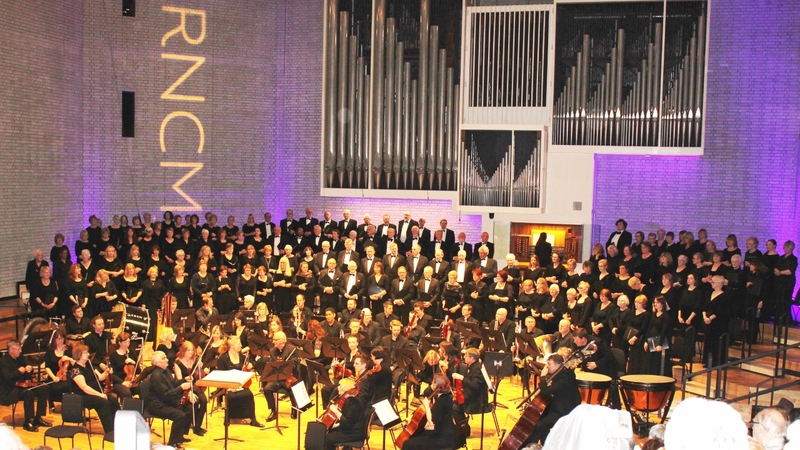 Let us be clear from the start: Saturday's performance of The Dream of Gerontius could only be described as amateur in the sense that, in common with the premiere at the Birmingham Festival of 1900 and countless subsequent performances, the chorus was unpaid. I doubt that there would have been many present on Saturday who would not have been deeply impressed by the professionalism and commitment with which the event was marked. Elgar's decision to set Cardinal Newman's poetic contemplation of the experiences of a dying man and of his soul's journey towards ultimate judgement was a bold one, and in the hands of a lesser talent, the result could have been disastrous. Writing in the 1930's, Basil Maine expressed the opinion that 'the average present-day reader looks upon (Newman's) poem either as a mainly incomprehensible exposition of dogma or else as a Jesuitical attempt to make him swallow a theological pill hidden in the jam of a human story'. He went on, however, to suggest that '...nothing need be incomprehensible, for although the composer wrote the work as a Roman Catholic, the idea of religious propaganda was entirely absent from his mind'. And there, surely, we have it in a nutshell, for it is Elgar, far more than Newman, who gave the narrative such a universal fascination. Elgar's musical language in Gerontius is complex, but not daunting, given the guidance of a sympathetic conductor, and of course, its apparent Englishness is borne of a multitude of mainly European influences such as Wagnerian leitmotive (themes representing 'Judgement', 'Fear', 'Despair' and 'Commital' etc.) and arioso, as well as the Richard Strauss of Death and Transfiguration. There are some rasping brass chords worthy of Sibelius, and a few orchestral punctuations in the Demons' Chorus that suggest Tchaikovsky, while the Angel of the Agony is introduced by a sighing idea on the strings which looks back to the last movement of Bruckner's 9th symphony, and through it forward to the first movement of Mahler's 10th. There is insufficient space here to explain adequately just why the performance of this masterpiece was so satisfying. The role played by Christopher Cromar cannot be underestimated, however. Aided by his superb orchestra he displayed a deep understanding of style and pacing, knowing exactly how to approach the big moments in a way that showed an instinctive feel for the split-second timing that can transcend the merely good, the chorus's glorious outburst of 'Praise to the holiest' perhaps being the most obvious of countless examples. In the context of the above, the soloists' contributions can finally be assessed. The role of Gerontious is perhaps unique in that the protagonist's suffering, hopes and frailties are laid bare in the wonderful orchestral prelude before he has sung a single note, so that in a way his task is not so much to announce himself as to add a new dimension to what has already been revealed. Christopher Bowen managed this with unwavering concentration, succeeding in riveting the audience's attention throughout the work. His vocal control was impressive, and he clearly understood the importance of his role in defining the structure of the work and in creating a convincing sense of forward progression. John Powell, who undertook the roles of the Priest and the Angel of the Agony at short notice, sang with a restrained dignity that was wholly appropriate, while Jessica Gillingwater undertook the wonderful role of the Angel with deep understanding, caressing the text of her final 'Softly and gently' in a manner guaranteed to touch the heart of all but the most hard-hearted. All in all this was a performance that stood on its own merits, not demanding comparison with Boult, Barbirolli or anyone else! Who was it who once described England as 'the land without music'?!! !